An Act establishing a Mint, and regulating the Coins of the United States. Although some of the provisions in the 1792 Coinage Act were adjusted as time went by, the majority of the rules specified in this Act remained in effect for decades. Essentially, it provided the framework for all subsequent coinage design and production. While the first draft of the Act stipulated that all coins would employ a portrait of the president on the obverse, the final version called for an image emblematic of liberty as well as the word "liberty". The Act also authorized construction of a mint building in Philadelphia, the nation's capital at the time. This was the first federal building erected under the United States Constitution. Mint director David Rittenhouse laid the building's cornerstone on July 31. On May 8, 1792 An Act to Provide For a Copper Coinage was signed into law by President George Washington. This legislation resulted in the birth of the copper cent, from which descends today's one-cent piece. The Act also stipulated that "the director of the mint... be authorized to contract for and purchase a quantity of copper, not exceeding one hundred and fifty tons... to be coined at the mint into cents and half-cents... and be paid into the treasury of the United States, thence to issue into circulation." Furthermore, "no copper coins or pieces whatsoever except the said cents and half-cents, shall pass current as money, or shall be paid, or offered to be paid or received in payment for any debt, demand, claims, matter or thing whatsoever." Merchants and bankers were reluctant to bring silver bullion to the Mint because the disclosure of the illegal silver standard that was previously in effect. [clarification needed] The silver coinage of 1794 and 1795 employed a 0.900 fine standard instead of the Spanish dollar 0.8924+ fine standard (371.25/416 = 0.89242788461) as prescribed in the Mint Act of April 2, 1792 (Heritage Coin Auction #390, Vol III, p. 117). The most immediate effect of this practice was that depositors ended up paying an additional 2.5 grams of silver bullion (about 1% extra) for every dollar they received (Taxay, 1966, p. 89). When this became widely known, bullion deposits brought to the mint declined significantly in 1796 and 1797. One side was to have an impression emblematic of liberty, with the inscription "Liberty", and the year of the coinage. The reverse side of each of the gold and silver coins was to have the figure or representation of an eagle with the inscription "UNITED STATES OF AMERICA." The reverse of the copper coins was to have an inscription expressing the denomination. Images of Liberty would remain a standard part of US coinage through the 19th century and into the early 20th. While European coins typically included a portrait of the reigning monarch, the idea of depicting a real, as opposed to an allegorical, figure was considered unacceptable in the republican United States. The image of Liberty used on US coins generally reflected contemporary standards of female beauty, and was redesigned every few decades to reflect the changing times, although the Seated Liberty image which graced coins starting in 1837 would end up being used for over half a century. Not until the Lincoln cent, issued in 1909 to commemorate the centenary of President Lincoln's birth, would a real person be depicted on a US coin. The Act defined the proportional value of gold and silver as 15 units of pure silver to 1 unit of pure gold. Standard gold was defined as 11 parts pure gold to one part alloy composed of silver and copper. Standard silver was defined as 1485 parts pure silver to 179 parts copper alloy. 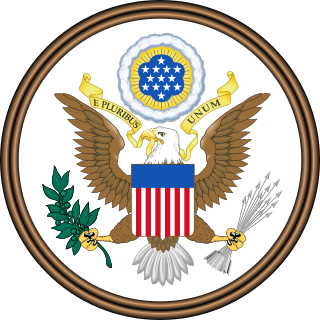 The Act also specified the dollar as the "money of account" of the United States, and directed that all accounts of the federal government be kept in dollars, "dismes", cents, and "milles", a mille being one-tenth of a cent or one-thousandth of a dollar. The silver content of a dollar under this act was almost exactly equal to 1/5 of the silver content of the contemporary British pound sterling, or 4 British shillings. Under Sec.14, any person could bring gold or silver bullion and have it coined free of charge, or later for a small fee, exchange it immediately for an equivalent value of coin. The paragraph summary states: "Persons may bring gold and silver bullion, to be coined free of expense;"
Quality control measures were implemented in that from each separate mass of gold or silver used to produce coins, three coins were set aside by the treasurer. Each year on the last Monday in July, under the inspection of the Chief Justice, the Secretary and Comptroller of the Treasury, the Secretary of State, and the Attorney General, the coins were to be assayed and if the coins did not meet established standards, the officers were disqualified from office. 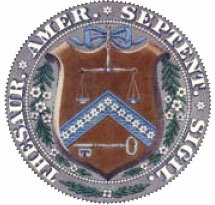 The meetings later became formalized as the United States Assay Commission, which continued meeting until it was disbanded in 1980. Section 19 of the Act established a penalty of death for debasing the gold or silver coins authorized by the Act, or embezzlement of the metals for those coins, by officers or employees of the mint; this section of the Act apparently remains in effect and would, in theory, continue to apply in the case of "any of the gold or silver coins which shall be struck or coined at the said mint." (At present the only gold or silver coins struck by the US mint are the American Silver Eagle and the American Gold Eagle coins, some Proof coinage at the San Francisco Mint, such as the silver US State Quarters, and much of the Commemorative coinage of the United States.) All other sections of the act have been superseded, as for example the Coinage Act of 1834 changing the silver-to-gold weight ratio. 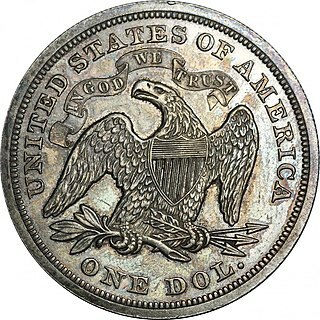 Various acts have subsequently been passed affecting the amount and type of metal in U. S. coins, so that today there is no legal definition of the term "dollar" to be found in U. S. statute. Current statutes regulating coinage in the United States may be found in Title 31 of the United States Code. ^ Nussbaum, Arthur (November 1937). "The Law of the Dollar". Columbia Law Review. 37 (7): 1059. doi:10.2307/1116782. JSTOR 1116782. ^ "Federal Reserve Bank of Philadelphia: Money in Colonial Times". Federal Reserve Bank of Philadelphia. Archived from the original on November 21, 2011. Retrieved 2008-04-02. ^ "Coinage Act of 1792" (PDF). United States Congress. Archived from the original (PDF) on 2004-04-07. Retrieved 2008-04-02. Nussbaum, Arthur (November 1937). "The Law of the Dollar". Columbia Law Review. 37 (7): 1057–1091. doi:10.2307/1116782. The Coinage Act of 1857 was an act of the United States Congress which ended the status of foreign coins as legal tender, repealing all acts "authorizing the currency of foreign gold or silver coins". Specific coins would be exchanged at the Treasury and re-coined. The act is divided into seven sections.